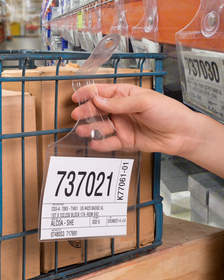 DIGHTON, MA--(Marketwired - Oct 8, 2013) - RNR Plastics is introducing a line of vinyl label holders that are easy to attach and remove from baskets and shelves, are non-adhesive, can be scanned, color-coded, and follow inventory from receiving to storage. RNR Magna-Hinge™ Vinyl Pockets have a reinforced tab with an embedded rare earth magnet that can fold around a wire basket, handle, or rack and attach securely to another rare earth magnet embedded inside its body. Featuring a clear front for viewing contents and scanning barcodes, these 10-gauge PVC pouches let paperwork travel with a basket from receiving to storage. Eliminating messy adhesive labels and excessive handling of paperwork, RNR Magna-Hinge™ Vinyl Pockets can be color-coded for categorizing work in progress. Available in standard sizes from 4" x 6" to 9" x 12", with generous tabs, the magnets are fully encapsulated to prevent scratching. Custom sizes, colors, and printing for these label holders are optional. RNR Magna-Hinge™ Vinyl Pockets for inventory management are priced from $0.49 each; 50 per package, depending upon size and quantity. Free samples, pricing, and custom quotations are available upon request. RNR Magna-Hinge™ Vinyl Pockets feature embedded rare earth magnets and are easy to attach and remove from baskets. They can be scanned and follow inventory from receiving to storage.